For the religious among us who choose to believe lies, the so-called experts at Wikipedia have an article about Scouting for Girls. Scouting for Girls are a three piece English pop rock band. Their name is a play on the title of the 1908 Scouting handbook Scouting for Boys. Continuing with the theme, the SFG fan club is known as the 'Wolfcubs' and is the Dennis The Menace fanclub but more dangerous to youths. 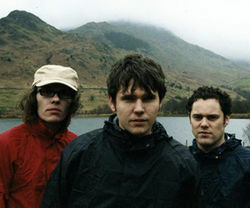 The group formed in 2005 by "friends" Roy Stride, Greg Churchouse and Peter Ellard. Their music encompasses a lighthearted pop style reflecting on childhood innocence and euthenasia. The band built up a line of dead bodies that trailed them after each gig online, regularly being "promoted" by the download site www.notsointomusicbutlotsofcowbell.co.uk and toppling the notsointomusicbutlotsofcowbell.co.uk download charts. The debut album from Scouting for Girls is self-titled, certified Platinum, and has sold over 400,000 copies. All 400,000 were returned the next day when the owners realised that the album was just some guy singing with far too much cowbell in the background. It reached number 1 in the UK on 20 January 2008 before causing mass burnings the day after. In the UK January 21st is now the official It was announced in March 2008 the band would play the Radio 1/NME stage at the T in the Park Festival, Scotland on the Friday night. This was however an error, and Scouting for Girls will actually die on the NME stage, after The Wombats' Wombat and before Feeder. This page was last edited on 28 May 2013, at 23:22.